In July 2016 the City of Sheffield Pipe Band were invited by the 12th Battalion Yorks and Lancaster Regiment to take part in the 100th anniversary commemoration of the Sheffield City Battalion who fought at Serre in France, on the opening day of the Battle of the Somme on the 1st of July 1916. Being part of the Service of Remembrance at the Sheffield Memorial Park, was a great honour for the band. The service, which was led by the Bishop of Sheffield, was attended by the Lord Mayor of Sheffield, as well as representatives of the Yorks and Lancaster Regiment. 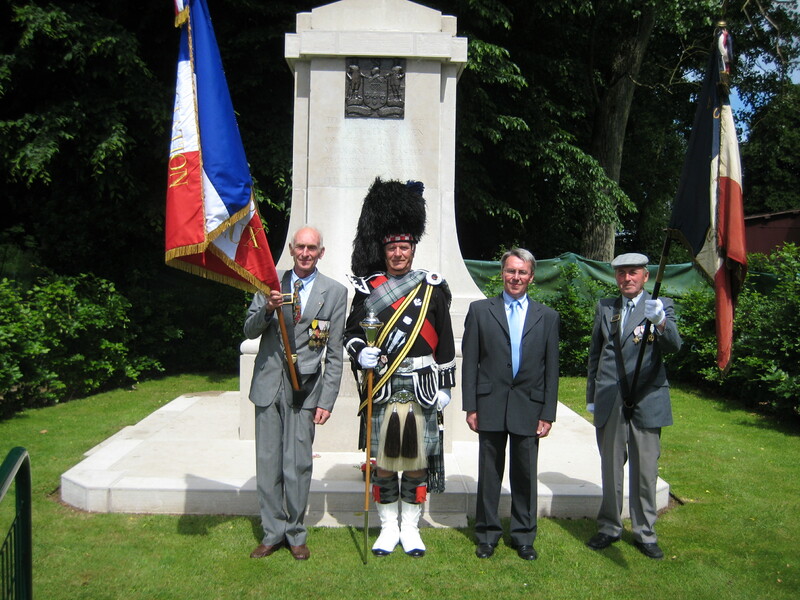 The band have visited Serre a number of times over the years, playing at the memorial park in memory of the young men from Sheffield, who fought and died there during the Great War. Following the Service of Remembrance at Serre, the band attended a Civic Reception in the town of Bapaume and led a parade to the towns War Memorial. Once again, representing Sheffield was great honour for the band. The links between Sheffield and Bapaume go back to the First World War, following which, George Lawrence from Sheffield raised money which helped build new housing and a school in the town. This was very much appreciated by the people of Bapaume at the time and built an enduring link between the towns, which carries on to this day. As representatives of Sheffield the City of Sheffield Pipe Band have always received a warm and friendly welcome on our visits to Serre and Bapaume and look forward to visiting them again in 2018. During 2015 the band also visited Bucharest. We had been invited to participate in a televised concert in the capital of Romania. One of the highlights was meeting the British Ambassador for Bucharest. Even though the temperature was extremely hot the band performed to a high standard and was greatly appreciated by the people of Romania. During 2014 the band received an email from a company called Euroart Entertainment inviting us to attend the Tunisian Folk Folk Festival 2015. A quick scan of forth-coming events was made and the difficult decision of either a full day of St Patrick’s Day Parade or a week in Tunisia was made, various options for funding were discussed and it was decided that the band were in a position to subsidise the trip for participating members. An early start for the band on 15th March to meet the departure of 06:00 from Sheffield ARMC, a bleary group of musicians gathered for a week of sun, sea, sand and Pipe and Drum music. After a hearty breakfast and a pint a trouble free check in at East Midlands we boarded and departed for Enfidha International airport Tunisia on what was an uneventful flight. Mini-buses boarded and we were on our way to Hammamet and the Laico Hotel, our 5 Star accommodation for the next 7 nights. The first evening was filled with meetings with the organiser and familiarising ourselves with the local area and available beverages. Day 2 commenced with another meeting with the organisers to discuss the itinerary of the forth-coming week, flexibility is the key to Tunisian organisation! Once the proposed schedule had been ‘pencilled’ onto the diary the band met outside the pool area for our 1st practice session, two hours later and a significant crowd of onlookers the Piper Major was happy that the band was tuned, drilled and ready to go – at this point we were advised by the hotel events coordinator that we could no longer practice in the hotel grounds as we are booked to play at the hotel on two occasions later in the week as a surprise act – surprise Pipes and Drums Band, that’s some secret to keep! Day 4 was our first performance day with the opening ceremony of the carnival for which we had the honour of being selected, alongside the German band……………….., to play prior to the press event. In full attire we played one on one at the Hotel Royal a short distance from our own hotel. The audience were extremely complimentary and the time we had put in over the previous day’s showed in the quality of performance we gave, well done to all. We are the 1st band of our genre to play at this event and it was said that the topic of conversation from all at the conference was all City of Sheffield Pipe Band. We featured on 6 television channels, numerous radio stations and reporters from all the major papers were in attendance. Unfortunately the day was marred by the terrible news that there had been a terrorist attack in Tunis, our thoughts go out to all those that lost loved ones. Day 6 – Carnival Day! Despite the tragic events of Tunis a few days before the Carnival was scheduled to commence at 14:30, Tunisian 14:30 is sometime just after 15:00 if it needs to be done! Resplendent in our new red shirts, chosen to reflect the colour of the Tunisian flag, the band paraded at the Medina to an expectant crowd of 1000’s. With Keith keen to warm the pipes prior to the Carnival March we found a quiet corner to set the drones and run through a couple of the tunes, within seconds a massive crowd had gathered. Thanks must be given to the security present for moving the crowds on to ensure our safety. As an unexpected and welcome surprise our newly found German friends requested the drummers join them in an impromptu Anglo/Deutsch performance which to say had not been planned worked well, tribute to the versatility of the band (drums in particular) to adjust at short notice! The parade started at around 15:30 from the Medina with the band leading off with our Bonnie Lass Set, clearly nerves had set in and it could be said that it may not have been our best performance, that said the crowd loved it and we got away with the less than perfect start! With the first set out of the way and the parade moving we were able to relax and enjoy the occasion. As the parade snaked its way through the town and towards the Marina there were numerous stops in which many a photo opportunity was taken by the spectators to add to the family album, it has been said that a home is not a home in Tunisia unless you have a photo of Dave White on the mantelpiece! We arrived at the Marina to crowds of 10,000 plus and the resolve of the Tunisian people was apparent in the anti-terrorist posters displayed by the crowd, a rousing ” Viva La Tunisia” given by the band whilst waiting to take to the stage for our performance sent the crowd into raptures and the crowd was warmed and ready to receive us. Following a pitch perfect performance and a foot-sure presentation of Highland dancing given by Alex and Ellie, Jim and the girls presented gifts as a token of our appreciation to the dignitaries present and gave a brief news interview for national television. 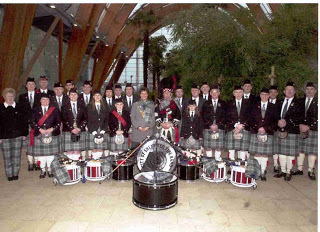 During the past years the band has toured thousands of miles and performed traditional Scottish tunes accompanied by Scottish dancers to many large and varied audiences. The band has visited China on two occasions to perform as part of the Chinese New Year celebrations and the Spring Festival. We visited the city of Chengdu at the invitation of the city officials. 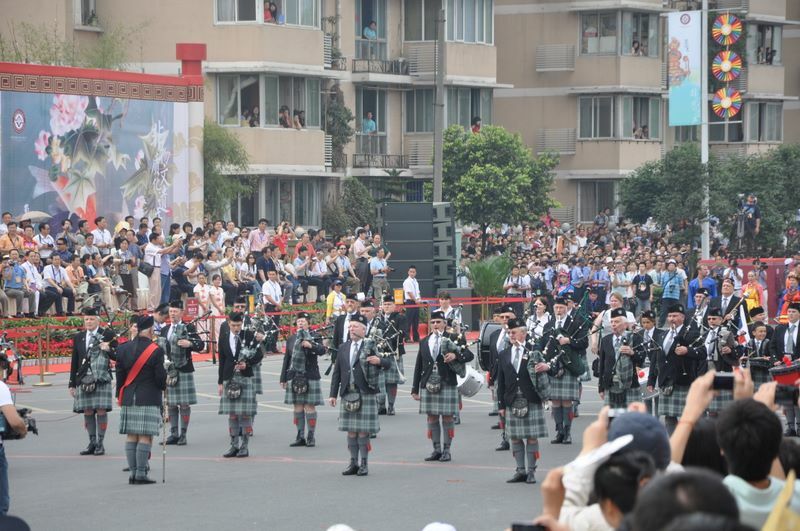 Although Scottish Pipe Music is not common in that part of the world the reception we received was fantastic and the thousands of Chinese visitors thoroughly enjoyed the performances. Whilst in China band members were encouraged to take part in local activities and traditions which included wearing the national costumes. The band was 100 years old during 2008 and it chose to mark the centenary with a truly unique tribute to the city of Sheffield’s history. We visited the Sheffield Memorial Park in Northern France which commemorates the fate of the Sheffield “Pals” Battalion in the First World War. The 30 pipers and drummers performed a ceremony of remembrance on the site were 513 young men of Sheffield were killed within 10 minutes at 7.30am on the 1st July in 1916. 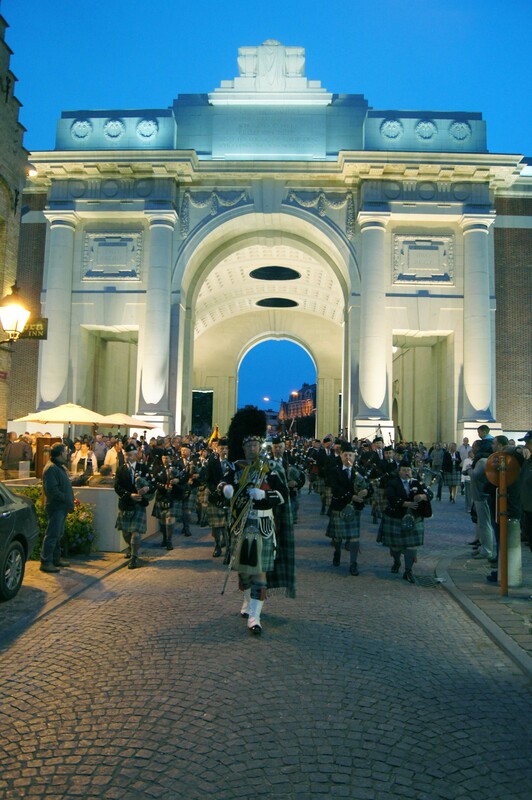 On two occasions the band has participated in the Last Post ceremony at the Menin Gate, Ypres, Belgium and at the Plugstreet memorial where more of the fallen Sheffield “Pals” are commemorated. All members of the band agreed it was a privilege to participate in the Last Post Ceremony and one which will never be forgot. which was specially designed in 2003 and presented to the city at a ceremony in the Winter Gardens Sheffield. 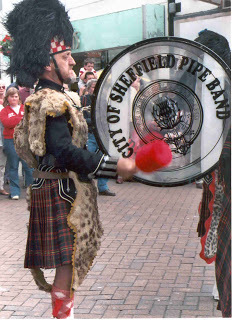 In 1991 Sheffield honored the band by allowing them to put ‘City’ into their title, thus becoming ‘The City of Sheffield Pipe Band’, of which the band members are very proud. 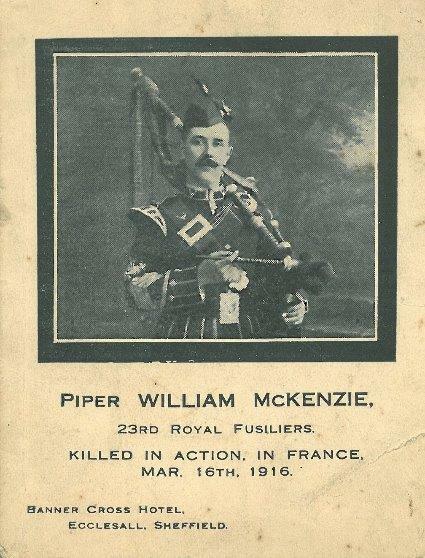 During the first world war one of Sheffield Pipe Bands pipers was unfortunately killed in action in France on March the 16th 1916. 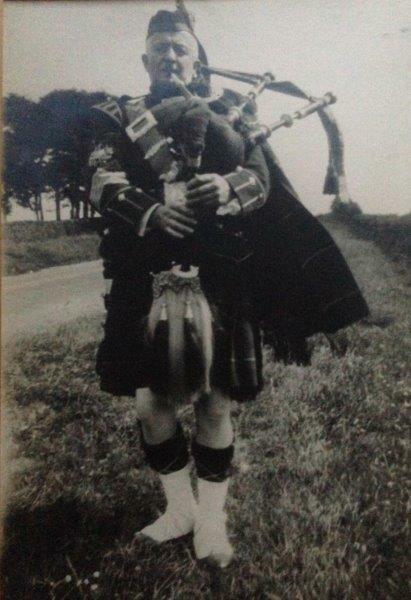 Piper McKenzie was born in Avoch, Ross-Shire, Scotland and later moved to Sheffield where he joined the pipe band. 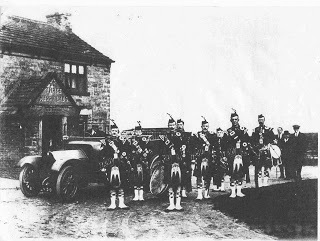 The band, then known as the ‘Sheffield Pipe Band’, was established in 1908 under the leadership of Pipe Major George Urquhart, to promote the learning and playing of the pipes and drums in the Sheffield Area. Born on the Isle of Skye he moved to Sheffield and was the honorary piper for the Sheffield Caledonian Society from 1906 to 1930. Over the years the band has survived two world wars and seen many changes in the city. Apart from a few short breaks for the war years and the odd financial difficulty, the band has now endured for over 100 years.